So far we've been quite lucky with the weather in the UK this summer, we've had some lovely hot days and have even had the padding pool out a couple of times in the evenings. I wanted a new ice activity for T and as a shelf in our freezer is currently empty, I thought I take the opportunity to use it to freeze water beads. 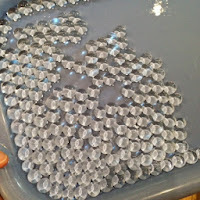 I started by making some water beads up as per the instructions. I then spread them out of a tray and froze overnight. When I took them out of the freezer they had slightly fused together, it only took a couple of minutes to break them apart (below) once they were separated I popped them in a plastic bag and refroze until we were ready to use. 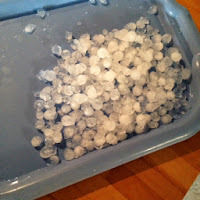 Sadly the weather turned when we were ready to use them but we still got them out to play with, we gave the bag a good bang on the worktop and like magic all the beads were separated I was actually amazed by this!! I put the frozen water beads in a stainless steel bowl for T to play with. They remained frozen for a good couple of hours and although defrosted obviously didn't melt. 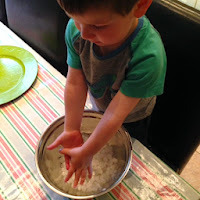 Freezing water beads puts a new spin on water bead play and also is a good new ice play idea, we'll definitely be doing this again when the warm weather returns. 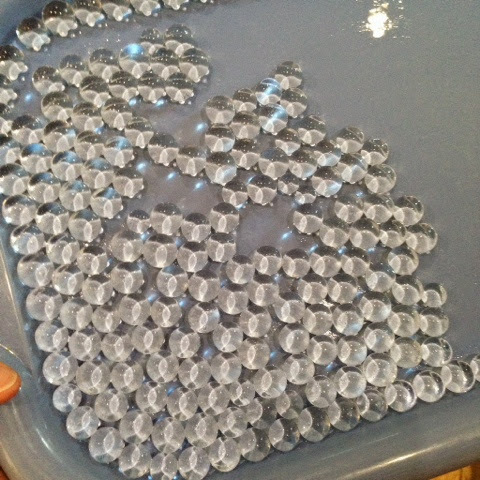 NOTE: water beads are not designed for child's play so make sure your children are past the mouthing stage before using. 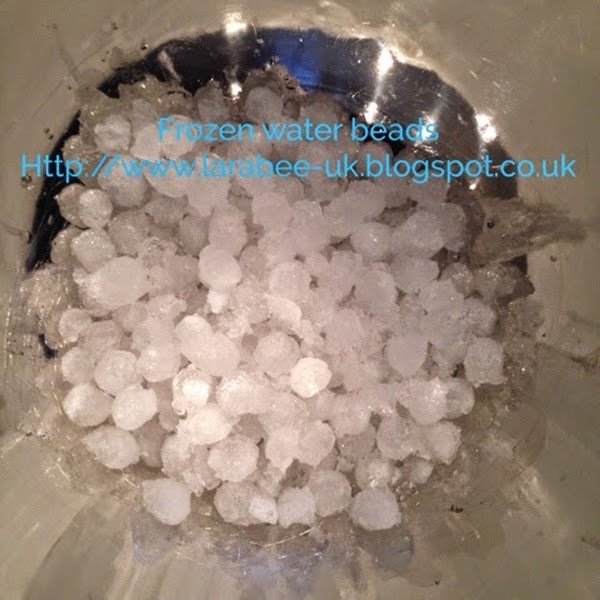 The clear water beads did look just like ice, so to avoid any accidents or confusion it would be better to use coloured water beads, clear water beads can be coloured by adding food colouring to the water when soaking.